The seventh Running of the Bulls in this year’s Sanfermines featured bulls from the Núñez del Cuvillo bull-ranch. 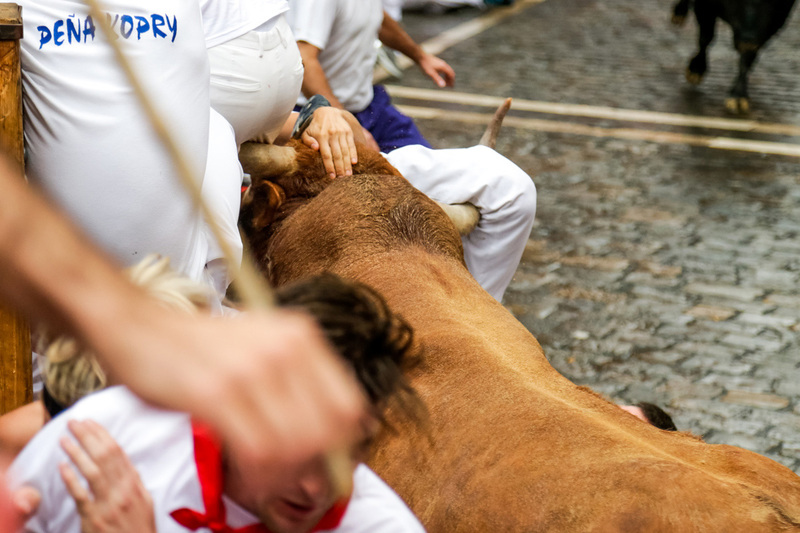 It was run at a very fast pace and there were some moments of danger at the City Hall stretch where a brown-colored bull charged and tossed several runners squeezed together at the fencing on the right side. One American runner received a goring to his right leg. There were also some injuries from falls on the stretch leading down into the bull ring where two bulls tripped up and fell. The first medical report states that six runners were taken off for hospital treatment – the runner gored to his leg and five others who suffered contusion and severe bruising. Today, the whole Running of the Bulls took just 2 min. 32 sec. The pack had come out of the pens in Santo Domingo in a tight group and already half-way up the slope, a brown-colored bull overtook the others and raced ahead at a very fast pace, threatening to charge at runners as it swung its head from side to side. Finally, it knocked over two runners on reaching City Hall square and then charged into a group of runners gathered at the fencing. One runner was knocked from the fencing to the ground and received a goring to his right leg. Four of the bulls ran close together up Estafeta Street allowing some of the runners to get close in front of the horns and display some fine running. Entering the final stretch leading down into the bull ring, two of the bulls slipped up and fell but they soon got to their feet and ran on into the arena and went directly to the pens in a very fast finish without any further complications. 24th running of the bulls held on wet ground from rainfall. The previous was on 07/07/2016. The 38th running of the bulls with the lowest temperature. The 1st was on 07/13/1980. In 7 participations the Núñez del Cuvillo have caused 8 gorings (1,14 per running of the bulls). In its 7 participations this is the 2nd time that Núñez del Cuvillo has run on wet ground from rainfall. The previous was on 07/12/2000. The 2nd fastest running of the bulls on wet ground from rainfall. The 2nd time that a goring took place on Ayuntamiento on Wednesday. The previous took place on 07/09/1980.